Hrvoje Ton was born in Zagreb where he completed his secondary education. In 1993 he enrolled in classical guitar studies in the class of professor Martin Mysliveček at the University of Graz, and after completing his studies, he got employed and at the same time enrolled in Master’s degree studies in the class of professor Carlo Marchione in Lovran. He has participated in numerous competitions and seminars where he achieved remarkable results. In 2011 he founded Chamber Ensemble Laurum for which he composes and makes music adaptations. As a pedagogue, he works at the Vatroslav Lisinski Music School in Zagreb, and together with his students he achieves remarkable results at domestic and international competitions. 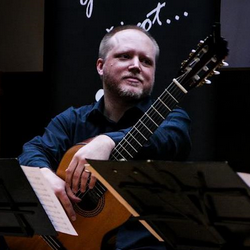 He is a jury member and holds lectures at international guitar events.